Spring has Sprung and it’s Time to Ride! Houston—get your cycling gear out. It’s time to ride around the city. But this is no ordinary bike ride we are talking about. We are talking about a Bike Tour, Houston—a Bike Bar Tour. A Houston “pedal tour” with you and all of your friends (or family! ), with music playing, drinks flowing, food a plenty, and more fun than you had any idea was possible. Picture this: you, and six to sixteen of your friends pedaling a mobile-bar around the city all day or evening long. Whether the sun is shining bright, or the night air is blowing a cool sweet breeze on your back, the city is hopping and people are everywhere. You’ve got your cooler full of favorite beverages of choice. You’ve got your own tunes playing (Houston Bike Tours will provide music if you prefer). And you can bring your favorite party snacks to accompany you on this amazing adventure around the City of Houston, whether it be the Eado District, Main Street, or a custom ride designed by you and yours. This is the best Houston Bike Tour you can find. And—this is the most fun bar you’ve ever “visited.” And you can take it with you everywhere all over town. And, when you feel ready for another bar experience, your bike-bar will take you to a handful of the best bars in Houston. It’s a Houston party bicycle bar, with a beer tour of Houston, Texas. What an amazing way to get your spring started. Not to mention getting in shape while you enjoy yourself and party with your friends. Most Bike Bar tours consist of about three to five bar stops. If you don’t know your way around the city, or would like to try some new places, our Bike Bar Tour drivers are very fun people to be around, and they will make sure your group has a great time while you are out. Let us take you to some of the best bars in Houston—Houston Bike Tours guarantee you will have a great time! These Houston pedal bike tours are like nothing you’ve experienced yet. 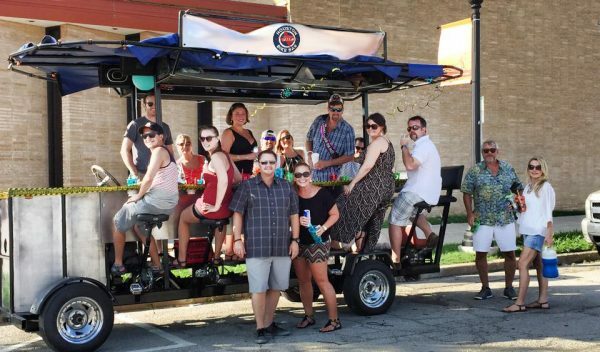 Houston Bike Bar Tours: Improving Company Culture with Employee Bonding. Houston Bike Bar Tours: Being a Tourist in Your Own City.